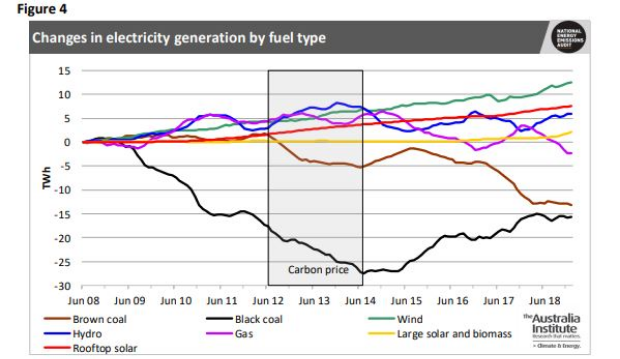 Renewable energy outperformed coal over Australia’s record-breaking summer of heat, data from The Australia Institute (TAI) shows. TAI’s Climate and Energy Program audit shows large-scale solar farms ran at 93 per cent capacity during the unprecedented heatwave on January 25 2019. On the other hand, Victoria’s coal-fired power generators operated well below capacity in the lead-up to the Australia Day Weekend. TAI says the era of coal is coming to an end. Continued growth of wind and solar power is outperforming both coal and hydro-electricity as the renewables sector goes from strength to strength. Renewables now make up 20 per cent of total electricity generation in the National Energy Market (NEM). Data comes from TAI’s National Energy Emissions Audit for the electricity sector covering January 2019. Wind and utility-scale solar now supply a bigger share of annual grid generation than hydro-electricity. The trend should continue with wind and solar generation expected to double by 2021, data shows. Carbon emissions have also fallen by 20 per cent in the NEM due to the rise of renewables and the ongoing decline of coal-fired power. On 25 January 2019, demand in the NEM reached one of its highest ever levels. However, Victoria lost around 1,300 MW of brown coal generation because ageing coal-fired power stations failed in the Latrobe Valley. As a result Victoria suffered power blackouts on the Thursday and Friday leading up to the Australia Day Weekend. State Energy Minister Lily D’Ambrosio blamed the outages on ageing coal and gas infrastructure. TAI data shows renewable generation grew by a third from December 2017 to December 2018. This is the largest ever growth of renewables in the NEM. The highest demand in NEM history was recorded in 2009. Last month’s day of peak demand would have taken this top slot if not for large amounts of solar energy easing demand on the grid. Traditional fossil fuel generation like coal and gas struggles to function when temperatures soar compared to renewable energy performance. There is some degradation of solar panel performance on hot, sunny days, but the abundance of light is overall a positive factor. Solar panels, however, are perfectly equipped to deal with Australia’s increasingly punishing summers. As a result, dispatchable solar thermal with battery storage could provide evening support. Extra solar PV also brings down peak demand on hot days.